We haven’t been around couples who have had babies in the recent past. However, over the last months we’ve known two couples who just had babies. I have learned some new things during these times. I had heard of gender reveal parties, saw photos and videos from some but we had never been to one. We had the pleasure to attend a reveal party for one of the couples. There were games and then what we thought was the reveal was a tease to one more surprise before the actual reveal. Lot's of fun. We also had two baby showers. One baby shower was the typical as I knew them attended by women only. The second baby shower we attended had men and women. That was a lot of fun too. Games at both were fun and got a lot of laughs. While doing some internet research before all these events, I was trying to learn the etiquette. During the research I found a new type party, at least to me. It is called a "sip and see". I laughed because as part of an international creatives group several members discussed how we "yanks" have a celebration for everything. Nothing wrong with that, right? Have you heard of a sip and see? I had never heard of that type party so I read several articles about it and thought what a fun concept for meeting new babies. The thought behind one of these parties is for people to get to see the new baby with a setting of light food and beverages. The specifics really come down to how each couple wants to set it up. You can search the topic and read all the ideas on planning one. Thinking about what fun that would be I have designed three sip and see invitation versions with one of my pastel swirl abstract designs. All invitation versions offer a generic baby feet template photo that can be left on the invitation so guests get the first peek at the party or replace that template with a square photograph of the new baby. I figured the easier the better for parents or someone planning the party so I made a grand Sip and See Watercolor Party Invitation Plus collection that includes party accessories and goodies that should work for a pink, blue, and non-traditional purple design. You'll find all this in my new Zazzle store PaPr Emporium. The flat card invitations come with plain white envelopes. Although Zazzle offers six invitation shapes, this design works best on the normal square corner (below), rounded corner and scalloped edge shapes. Zazzle also offers 12 paper types that range from a semi-gloss to a metallic silver. Even though the invitations come with envelopes you might want to give a peek into what's inside with a matching envelope. These envelopes are vibrant matte, 80lb text-weight paper that contains 50% recycles content (10% post-consumer waste). 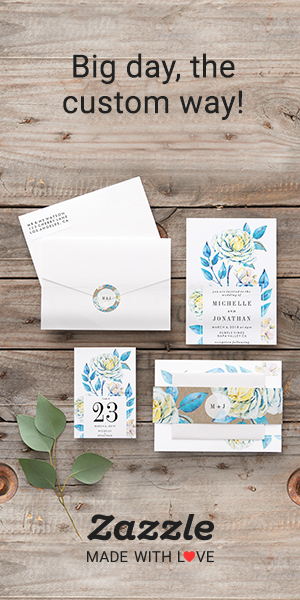 The inside features the pastel design on the invitations. Besides the matching paper cups, paper plates, and napkins in the collection like shown in the top photo there are sweet treats. You'll find cake pops and chocolate covered Oreo's with the design. Leave a comment to let me know what you think. If you would like assistance please let me know. Beautiful and fun party collection! Thank you so much, Annette. I LOVE pastels and this seemed the perfect match. I appreciate you stopping by to check it out AND to comment.